The LifeDop 250R features a display, hand-held Doppler with superior sound quality, extended battery life, enhanced probe sensitivity, interchangeable probes and a one-year full warranty. The large, informative display shows battery life, signal quality and extended 50 to 220 bpm heart rate. It includes a battery recharging system where you don't have to worry about overcharging or draining the batteries. The 3 MHz obstetrical probe is optimized for early fetal heart detection and designed for use during the entire pregnancy. (It is the best general purpose obstetrical probe). Ultrasound Probes/Dopplers can be found in our extensive online collection of products from globally recognized and trusted brands, including Summit Doppler. 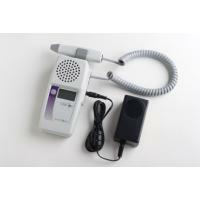 An excellent option to consider is the LifeDop Display Hand-Held Doppler with Recharger.